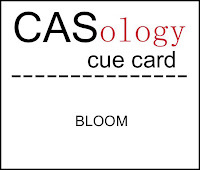 This week's CASology Cue Card is Bloom! Certainly everything is in bloom here in Toronto. It's a gorgeous time of year, although the poor allergy sufferers are, well, suffering! My friend Shirley made a dotty card recently and I really like the idea (I used it once here). For today's card, I thought I would take it a step further and make the dots the main focus. I cut out a large blossom on my Silhouette Portrait and then made dots around it with some Copic markers. It's very difficult to do them all perfectly spaced and the same size, so I had to tame my OCD tendencies and embrace the beauty of 'imperfection'. Hey, if you can't get something perfectly even, then make it look like it isn't even ON PURPOSE. At least the sentiment is straight! lol! 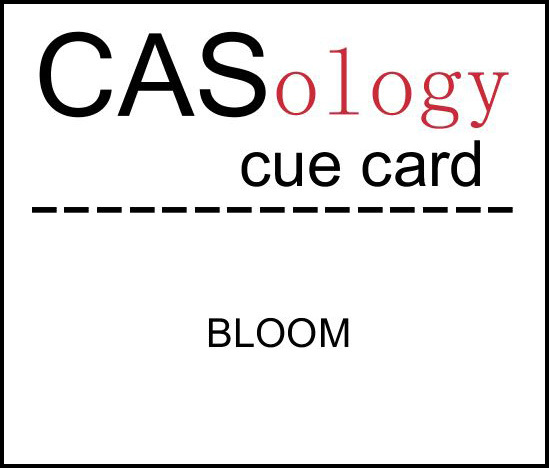 Now it's your turn - make a "blooming" card and link it up before the deadline on Sunday at 4:00 pm CST. Here are links to the blogs of the other DT members - go check out what they've done with this week's Cue Card! A very very pretty card Ardyth! Ok Ardyth, if that's your 'imperfection' what hope is there for the rest of us?! Fab card - what a great idea! I love the imperfection of the dots on this flower, and the color combo is fabulous! It's really great to see how such a large image can work so well for a CAS card...Love it!!! You have a great steady hand!! !, a fantatic technique for make a perfect CAS card, i like the bright colours, perfect for springtime, so clever design Ardyth. Quite amazing! Bold and beautiful. This is so fresh and a whole lot a fabulous fun! Aw...how FUN is your large bloom with dots! Love it, Ardyth! you have quite the steady hand to dot all those dots! i love ALL your designs.. so creative & clean! fantastic card, ardyth... love the perfect imperfection!! I'm pretty sure mother nature is perfectly imperfect too! Love this flower and your advice is spot on! I wouldn't have even noticed the imperfections if you hadn't said anything. :) Love this. Ardyth, I don't see any imperfections...this is awesome! Cheerful, fun, and oh so CAS! You're too funny, Ardy! Even Mother Nature's OCD tendencies lapse once in a while. And, anyway, I thought your dots WERE perfect until you mentioned it!! Love your dotty flower, I have trouble making imperfection look okay just as much as perfection!!! We are starting to bloom over here too but no sign of my hayfever yet!! I can't believe you did the copic dots by hand! A real labor of love ;) It looks fab! I love your philosophy, Ardyth! This is perfectly imperfect! :) Seriously! This card is so striking. I can't believe you did it all by hand. But, then, I do believe it because how could a stamp do this? Super idea. And, congratulations on your Moxie Fab prize--I saw your name on the winner's post. Hope you get something fun. ...so, I thought Shirley was cra-crazy with the dots on her card...but I think you have more dots than hers...so you win the 'Ca-rzy lady dotting award'!!! This is fabulous - love how you have made imperfection a beautiful thing! Very cool card for bloom, love you sweet imperfection and I give you a big high five for that because my OCD totally gets it! Brilliant! Sometimes imperfection is OK, is this is definitely one of those times. The fun and spontaneous feel it gives suits this type of flower. Terrific idea & I love how it turned out! Ardyth this is SO FUN!! I just love your polka dotty flower!! Just beautiful and those colors, wow. Your card makes me smile and so fun that you did this all by hand, stunning. Love this one!! Great choice of colors!